Hurray! I burnt out on Persona Q1 but it was a fun experience for 50+ hours. The controls are a bit weird, and the port doesn't do much to fix that. I don't remember struggling with the controls in Luigi's Mansion: Dark Moon nearly so much, but I'd have to replay it to see what the difference might be, if there even is one. Tilting the console to look up and down helps, but getting pointed in the right direction can sometimes be a struggle, especially in tight spaces where you need to get pointed at a ghost just so. There's a big emphasis put on score chasing, and you get a rank at the end of the game based on how much money you collected in each chapter. That's a design trope that's largely fallen by the wayside, although character action games and indies keep it on life support. I ended the game with an E rank, and I can't imagine replaying just to try for a higher score. Dark Moon seems to have replaced the score element with collectibles, and... yeah, I have to admit that I dumped significantly more time into that game to get all the gems. Otherwise, Luigi's Mansion looks and plays so nicely on the 3DS, and has enough forward-thinking design, that I would believe it as a new release, score chase aside. Where some of the platform's other ports have felt pretty anachronistic, Luigi's Mansion fits right in. I did end up buying a super cheap copy of Dark Moon from Target, so I'll replay that later in the year to compare. There's also a good chance that the third game will come out on Switch this year. Yup, sounds about what I expected. People went gaga over Luminous Arc on DS due to the production values, which were great for the DS, but the game was so bland and fit mid-2000's anime and JRPG tropes to a T. Sounds like Stella Glow continues that trend, but uses the current tropes, which I find even less endearing than those from a decade+ ago. You're welcome! I'm still playing it here and there. It's a smooth enough pour that I can play a mission or two while bouncing between other games, but it's not something I ever feel like sticking with for very long. I'm confident that however long I end up playing it for, I'll look back at my 3DS activity log and wonder what the hell I was thinking. I started Hey! Pikmin last night, a game that I think everyone lost interest in before the first trailer had even ended because it wasn't a proper Pikmin game. After an hour or so, I can say with confidence: it's not a proper Pikmin game, but it might still be a good one? It's a Pikmin-themed puzzle platformer where you can't jump but can through your units around, and so far I've enjoyed it for what it is. I suspect anyone expecting a real Pikmin game would be disappointed, but I've long thought that part of being a Nintendo fan is gamely going along with it when they decide to use characters you know and love in games completely divorced from what you know and love about them. I played the demo of it when they first released it. My memory is that I thought of it as a fun game in its own right, and if it had come out when the 3DS was my primary console I probably would have bought it. I love my Switch too much though, it'd take a lot to get me to buy a new 3DS game at the moment. Samus Returns might do it at some stage. I've been on a bit of a 3DS trip this past couple weeks. Sampling demos I've missed, picking away at Trio of Towns and revisiting an old favourite in Rhythm Paradise Megamix... and very nearly purchasing a few like Warioware Gold and Samus Returns. Not played anything on PS4* or PC since digging the handheld out of the drawer. The 3DS might have just about reached the end of its lifespan, but it'll be a fair while yet before I say bye bye. *Edit. Oh apart from Rime with the boy. Double edit, I might have to try that Pikmin demo. Ta. I stalled out on the games I was already playing (Hey! Pikmin, Stella Glow, and Persona Q), so I started up Monster Hunter Stories. The sales pitch for Monster Hunter Stories is that it's basically a cross between the Monster Hunter series and a monster collecting game like Pokémon. I have a conflicted relationship with Monster Hunter. I've tried playing Monster Hunter 3 multiple times in multiple platforms, and I really enjoy most of it. However, I find the last part of each hunt, when you're chasing down wounded animals to finish them off, emotionally distressing enough that I've mostly set aside the entire franchise. At the same time, I have a less conflicted relationship with Pokémon: it's boring, and I don't like it. I don't wanna catch 'em all. I wanna play something else. With all that said, a few hours in, I'm really enjoying Monster Hunter Stories. The influence of the Monster Hunter series is readily apparent with a focus on exploring open spaces to collect materials and hunt monsters, with none of the agonizing slowness of Pokémon. While not as adult as the proper Monster Hunter games, Stories has much of that series's familiar goofiness and charm. Best of all, you don't chase wounded animals and beat them to death. I may have finally found a Monster Hunter game I can play. I really liked what I played of Monster Hunter Stories. It's dawning on me recently that I fall off too many games that I'm enjoying way too easily. It's got the style of MH but given a super cute makeover. Like it's gone through Pokefier. I can see stalling on Stella Glow and Persona Q, but you had a bit of a positive response to Hey! Pikmin. I'm a tad surprised that one got stalled out. How long did it take before you just didn't feel it? Do you expect to return to it? However, I find the last part of each hunt, when you're chasing down wounded animals to finish them off, emotionally distressing enough that I've mostly set aside the entire franchise. I recall you mentioning that, and I remember seeing it a bit for myself when my friend showed me Monster Hunter on the WiiU. Of course, my response was closer to "Oh cool, they actually change behavior!" I was curious if I'd be bothered by it too, but in Monster Hunter World it feels so mechanical that, no matter how good the rendering, I see through the illusion. Now, I don't bring this up to counter-argue your feelings or say it's not a big deal or whatever. I'm more curious if there are experienced Monster Hunter players that might say "Yeah, they toned down that element in World" or something. Regardless of whether they did or not, however, I can see feeling sympathy even for a fictional creature that's just trying to limp on back to its home. I stalled out on PQ as well although that was after 60 hours. I'm certain I'll return to Persona Q. I just hit that point with it where I need to play something else for awhile. I'm not so certain that I'll return to Stella Glow. Hey! Pikmin I'll go back to, but the game's later levels have been a bit frustrating. It's surprisingly easy to lose all or most of your Pikmin to a single event, and the later levels have a lot more bombs and falling rocks and giant birds with stompy feet. I think it just wasn't what I was in the mood for at the time. No, the limping behavior in World the same as in every other MH game. The impact might be even worse for Clock than MH3 because of how much more realistically the monsters are rendered. - All your monsters in your active stock get 100% of the experience from every battle you fight, even if they don't fight in it. - You can craft experience-granting items for your monsters from materials you harvest or get as loot drops. One of my biggest pet peeves in these kinds of games are there's so much inertial force against swapping out your monsters or evolving them or otherwise changing your lineup in any way. New monsters seem to start out at level 1, and so you're stuck slowly and painfully nursing them back up to the same level as everything else was when you found the new thing. I know this. I nevertheless keep having to talk myself out of buying Monster Hunter World. It's even half-off on Xbox right this minute! Clocky, did you ever play Mario & Luigi: Bowser's Inside Story + Bowser Jr.'s Journey? The base game (Bowser's Inside Story) has been in my backlog for years, and I'm finally going to finish it this month. I'm definitely not going to get the expanded game because I don't have any interest in replaying the base game after I finish, but I'm curious if the extra content is really good, or just more of the same. I have not played the 3DS version, no. I played the DS game a few years ago and wasn't really a fan, so I haven't given more than a passing look to the port. It's apparently been a grazing sort of month for me with gaming, because I've sampled something like a dozen games in the last couple weeks. Included in that are two 3DS games I tried previously and bounced off of pretty quickly: Etrian Mystery Dungeon and Final Fantasy Explorers. Etrian Mystery Dungeon promises, as the name implies, to be a mash-up of the Etrian Odyssey games and the Mystery Dungeon franchise that encompasses everything from Shiren the Wanderer to Pokémon Mystery Dungeon to Chocobo Mystery Dungeon to God only knows what else. At heart, the Mystery Dungeon games are turn-based rogue-likes where each run is a dive into a dungeon to see how far you can get with your wits and experience and whatever you scavenge along the way. And the Etrian games are party-focused dungeon crawlers where you progress through a labyrinth one pain-staking dive at a time. There's a lot of interesting potential for overlap there, so I was curious to see how Etrian Mystery Dungeon mushes the two together. The answer is something with parts recognizable from each of its parent franchises but a whole that's not necessarily appealing to fans of either. Less alchemical chimera than bad taxidermy, if you will. Which is why I gave up on it initially. It didn't give me what I look for from either Mystery Dungeon or Etrian Odyssey, and I wasn't quite sure what to make of what it does have to offer. Giving it a second chance a year or two later, I'm in a bit of a different headspace with it and more prepared to meet it on its own terms. It's... weird. The core gameplay loop involves sending a party of explorers into a set of small, procedurally-generated dungeons to farm materials and equipment, and then return to the surface to cash all that in. Lather, rinse, repeat, until you can scrub the boss at the bottom of the dungeon and move on to the next one. Where each run in a rogue-like carries with it the expectation of most likely dying at the end, Etrian Mystery Dungeon expects you to know your limits and bail out before your party wipes. And where Etrian Odyssey proper relies on you to gradually accumulate perfect knowledge of a space, Etrian Mystery Dungeon expects you to become familiar with possible spaces and adjust your plans accordingly. So it jars heavily against both franchises' key principles, but I've nonetheless managed to have a bit of fun with it. I don't know if I'll stick around, though. I've also managed to find a bit of fun in Final Fantasy Explorers, a sort of poor man's Monster Hunter built from the Final Fantasy IP. It has familiar jobs, monsters, abilities, and concepts, but the combat model, while serviceable, isn't particularly exciting. While Monster Hunter focuses on carefully planning your hunts and managing your resources, Final Fantasy Explorers mostly wants you to show up and use flashy attacks until iconic monsters also doing flashy attacks fall over dead. It's very Final Fantasy, and it's engaging enough to not be bad, but... Eh. Yeah, I'm glad I didn't really connect Final Fantasy Explorers with an imitation of Monster Hunter or else I'd have never tried out World. It's not that I disliked Explorers, my roommate and I tried playing it co-op for a while, but it just... I mean, it's actually pretty forgettable, and it really failed to engage me in any meaningful way. I wouldn't be surprised if you drop that one. I've started Bravely Second just recently. Enjoying it but not a fan of some of the mobile game mechanics that they decided to include. Someone earlier (I think DSG) was asking about games with good mood or atmosphere. I think Monster Hunter Stories fits that bill perfectly. It's sweet and colorful and optimistic. So far, there isn't even a villain, just a force of nature you're guarding against. The characters and world are all really charming, and it's got just enough crunch in the mechanics to keep me hooked in there. It's been quite awhile since I did an update here. I dropped a few games for different reasons. Persona Q, which I was enjoying, but I am just done with the Persona Team games for a long while. Stella Glow and Hey Pikmin, which were just too boring to stick with. Pokémon Moon, because I have hopefully finally learned my lesson that the Pokémon games are really not my thing. I played through two of the Picross e games. They're Picross! They're my happy place. I don't really have anything else to say about them other than that, except that the Micross puzzles in Picross e2 are pretty dull. I also played through Poochy & Yoshi's Woolly World, which was fun-ish. I'm not a huge fan of the Yoshi series because I've never much cared for the controls, especially egg-spitting. However, this game has a pretty fun assist mode that make the whole thing a breeze. It was a really relaxing game. I'm now working my way through Luigi's Mansion: Dark Moon for a replay. It's substantially better than the first game in most ways, although the mission structure is a bit weird, especially when some of the collectibles in a location are available in any mission and some are only available in specific missions, for reasons I don't quite understand. My 3DS is on ice for the moment but it had a good run. Finished DQ7, Xenoblade Chronicles and Bravely Default 2nd. That's probably 200 hours. The ability to aim your eggs in Crafted World seems to work well so far. I'm finding the game really relaxing too, in spite of feeling like I need to hunt down all the collectibles. This is on my list of games that I'd like to play before my 3DS is retired. I look forward to hearing your thoughts. The ability to aim your eggs in Crafted World seems to work well so far. They changed the aiming mechanism for Crafted World, and based on the demo, it's so much better. Woolly World still uses that same aiming system from the original SNES game where you have a fluctuating reticle next to Yoshi that you need to aim with. I'm apparently really bad with angles, because I miss anything that's a little bit further out than the target itself. 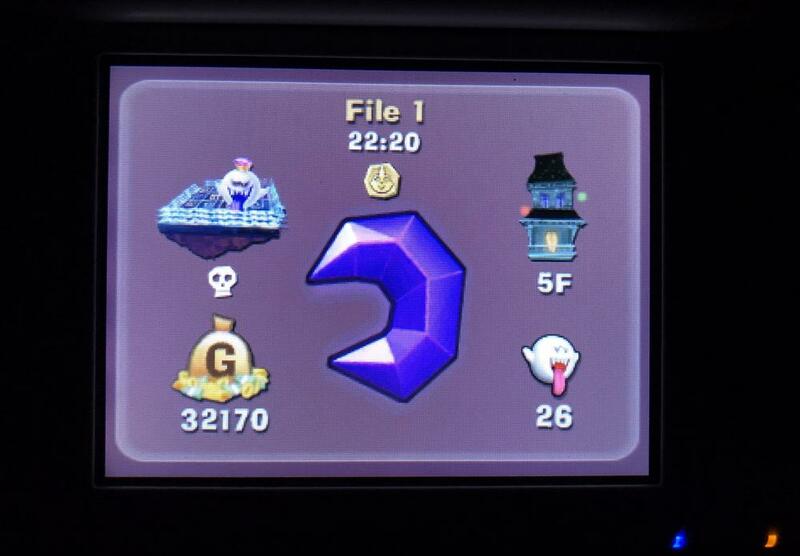 I've been a big fan of Dark Moon/Luigi's Mansion 2 since it launched, although I hadn't played it since then. So far, it holds up well to my memory of it and remains one of my favorite 3DS games. Basically, it's like Luigi's Mansion with four different, slightly smaller locations that evolve over the course of several missions in each location. So the first time you go into a place, there might be a locked door you can't go through, and in the next mission there's a ghost with the key that you can catch. So even though you're going through the same space multiple times, you're seeing a different part of it each time, and it changes in different ways each time. The only real issue with Dark Moon, and this is also true to my recollection of it, is that the boss fights in each zone can be really frustrating, and some of the combat encounters just drag on. The game's designers were clearly more interested in a challenge than I am as a player, because they like to throw a few waves of ghosts at me when all I really want to do is just explore the next room. But if you've been wanting to play it, I don't hesitate to recommend it. It's absolutely worth playing through. And if you're the type who likes collectibles, there are some really fun and clever collectibles in each area. Let me know if you figure out a strategy for the ice world boss. My second playthrough stalled on that guy and is largely what keeps me from going back. 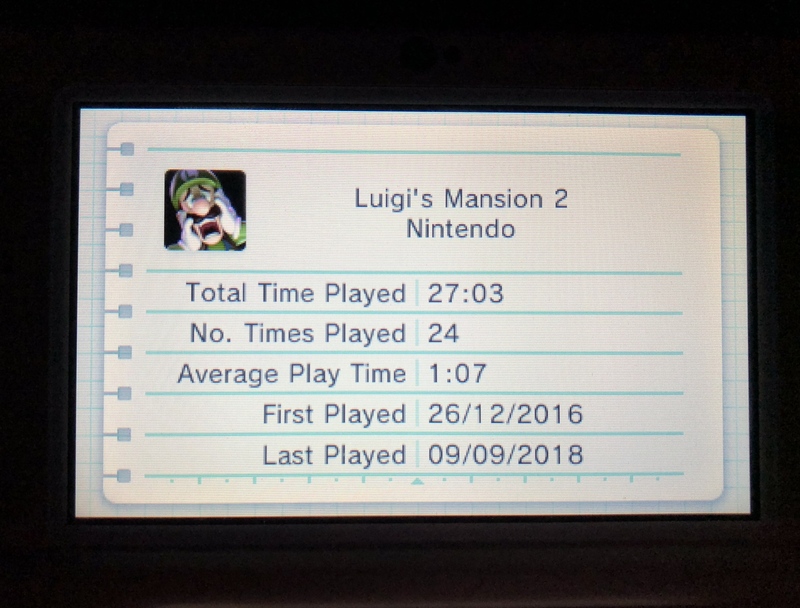 I very much enjoyed playing Luigi's Mansion 2 ( as we call it in the UK) but I did miss the format of the first game compared to the second. That said, I did come to appreciate it as the game went on and it's pick up and play ability compared to the GameCube's sit down sessions. I thought the visuals were great, with the 3D on the 'New' hardware really making a difference. The music is also stellar, Pro E Gadd's little hip hop beat will always be cool but the rest of the score was also very fitting. I think compared, naturally, to the first game the music sets a different tone - somewhat more jubilant. King Boo, is soooo cool with his hulking presence, mean dark eyes and jewel crown. Proff, E.Gadd, is his usual slightly selfishly agenda’d self and what seems to me like an eastern European charm. The ghosts are possibly the stars of the show in the second game, with again individual stereotypical character design to match their appearance. The cheekiness of the green ghosts capturing what seemed like to me an adolescent mischief making pest. very good. Again, comparing it to the first one, unfairly perhaps but naturally, it doesn’t feel as good as on the GameCube controller which was a perfect fit and gave fabulous feedback with the triggers, proper analogue stick and rumble. The games not hard, the difficulty comes from the unknown, not knowing the trick or the necessary dance required to make the ghosts vulnerable. The isolation is lost from the first game though I feel, I’d spend tens of minutes sometimes wondering around trying to work out what I had to do to trigger ghost to appear, or where to go next. Often, I’d do the old switch it off and come back to it a day later trick. With Dark Moon you can simply just keep pushing and you’ll chop through it in no time. Overall though, I really enjoyed my time with it and I'm looking forward to the third entry come the end of the year. I'm not really sure how I want to be set out though, whether I'd prefer the classic single mansion option with gated doors and riddles, or something more akin to the second game - either way I think I'd be happy with either but I think I'd prefer the original style. I also dipped my toe into online multiplayer that I found was still rather active and quiet fun. These were my ending results. And if you're the type who likes collectibles, there are some really fun and clever collectibles in each area. Collectibles? I love collectibles! You wanna see the Caramel Billboards that I collected from throughout three different courses in Yoshi's Crafted World?? There's bound to be some event or time in the near future when I'll need the extra portability of 3DS. Luigi's Mansion and Samus Returns are both top of my list for when that happens. Edit: Would ya look at that, Samus Returns just went on sale on the EU eshop... 33% off. Time to put my money where my mouth is. I loved the first Luigi's Mansion, but I couldn't get into Dark Moon. I ended up dropping the game after a couple of hours. The mission structure made the entire game feel like a chore to play by forcing you to replay the same areas over and over again. The first game was a short Metoidvania that didn't waste your time with artificial padding. I appreciated that. I hope that the next game goes back to the structure of the first game.